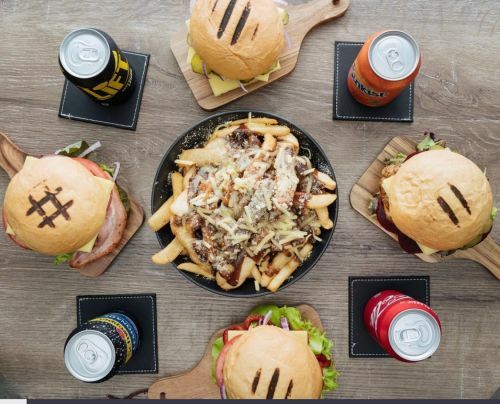 Harding's Burger Joint - Hawthorn uses their own specialised couriers to deliver their food. All Gourmet Burgers are served with toasted brioche bun with 100% grass fed organically farmed South Gippsland angus and locally sourced La Ionica chicken. Angus, double cheese, pickles,onion, ketchup and mustard. Angus, dried chilli, cheese, salad, onion, jalapeno, habanero hot sauce and peri peri. Bacon, egg, cheese, hash brown, chipotle BBQ, and caramalised onion. Premium veggie pattie, salad, tomato, onion, roasted peppers, aioli and chipotle BBQ. Angus, cheese, salad, beetroot, egg, onion, tomato, ketchup, mayo and mustard. Angus, bacon, salad, cheese, tomato,onion, chipotle BBQ and Japanese mayo. Grilled chicken breast, salad, beetroot, pickles and sweet chilli mayo. Grilled cayenne chicken breast, salad, cheese, roasted peppers, jalapeno, habanero hot sauce and peri peri. Grilled Tuscan chicken breast, bacon, salad, cheese, tomato, onion and smokey chipotle mayo. Crumbed chicken breast, salad, sweet chilli mayo, cheese, roasted peppers and aioli. Lean, Lamb patty, onion, roast peppers, salad, tzatziki. Crispy crumbed chicken breast, double bacon, double cheese, caramalised onion, smokey chipotle mayo, and Kansas City BBQ. Rocket, spinach, chia seeds, mixed leaves,parmesan, extra virgin olive oil, balsamic glaze and romano pecorino. Beetroot, rocket, feta, toasted walnuts,roasted pine nuts, extra virgin olive oil, balsamic glaze. Grilled Tuscan chicken breast, mixed leaves, light Thai dressing,Spanish onion, sweet corn kernels. Mixed leaf, rocket, sweet Asian style dressing, semi-dried tomato, corn, crunchy noodle, roasted mixed seeds. Steakhouse chips, gravy, mozzarella and parmesan. Steakhouse chips, gravy, death sauce, jalapeños and dried chilli.